By Geoff Carmody - posted Friday, 29 June 2018 Sign Up for free e-mail updates! Black holes are dense. Their centres are gravitational 'singularities'. They have zero volume and infinite density. There's a region around each within which gravity is so strong even light can't escape: hence the label, 'black hole'. The boundary of this region is called the 'event horizon'. Any object falling within this horizon can't go back, only further in. Renewable energy targets (RETs) impose anthropogenic cost 'event horizons' on base-load power. These 'horizons' are power cost points of no return. Once we cross them, there's no going back on power costs, unless revolutionary energy technology improvements (eg, 'cold' fusion?) allow us to overcome the arithmetic of power cost 'gravity'. Intermittency is the problem. Some solutions to the problem (eg, nuclear power) seem to be an antipodean taboo. The inherent intermittency of renewables, like wind and solar power, combined with policy-imposed RETs, force base-load power itself to operate intermittently. Base-load generation is the foundation for reliable, cheap power because it operates continuously. It's not designed to be turned on or off all the time (and unpredictably). 'Peaker' generators, plus wind and solar, fill that role. 'Peakers' can generate all the time, but cost more. Wind and solar can't. They depend on the sun and weather. Priority to renewables power necessitates 'crowding out' cheaper continuous power generators. Take wind as an example. Official data for SA shows, on average, wind turbines generated only 29% of their 'plate rated' capacity in 2016-17. To illustrate, suppose governments set a RET, to be delivered only by wind power, rated capacity of 100, of exactly 29% each year. That requires 100% of wind's 'plate rated' capacity to be used at least 29% of the year. To hit this wind-based RET of 29% for a year, policy in fact imposes a 100% RET when the wind is blowing. Therefore, base-load generators cannot supply power in competition with wind turbines for 29% of the time. Instead of operating continuously, base-load generators in this case can only compete to supply power, at best, 71% of the time. It's clear policies favouring intermittent renewables, like RETs, force all power sources to become intermittent. Why? Because government policies protecting renewables dictate they must – or exit the energy market. For base-load power, curtailing supply hours destroys its economics. Generator costs must be recovered if base-load power is to be viable. Spreading the costs on a 24/7 basis keeps $/MWh costs as low as possible. Forcing such base-load suppliers to turn on and off means shorter operating times across which to spread their costs (net of savings on fuel inputs). There are extra costs from stop-start operation. The cost implications of this are illustrated in the chart below. This chart is applicable to any wind, solar, or other renewables mix. It applies to any given $/MWh cost of base-load power in continuous operation. Importantly, it assumes extra costs from stop-start activity roughly offset fuel input cost savings from such intermittency. The net balance of these is extra detail. It does not invalidate the basic picture. The chart shows the % decline in generation cost-competitiveness for base-load generators as increasing RETs make such generators operate more and more intermittently. Approaching a 100% RET, the required % increase in $/MWh costs for base-load viability (the % loss of cost-competitiveness) approaches infinity. The shaded area covers the range of RETs advocated by our governments. Black hole-like, this is the base-load power cost 'gravity well' curve we face. % cost increases (competitiveness reductions) for base-load power themselves increase as RETs increase. With a 25% RET, base-load power costs increase (competitiveness falls) by about 33%. With a 30% RET, base-load power costs increase (competitiveness falls) by nearly 43%. 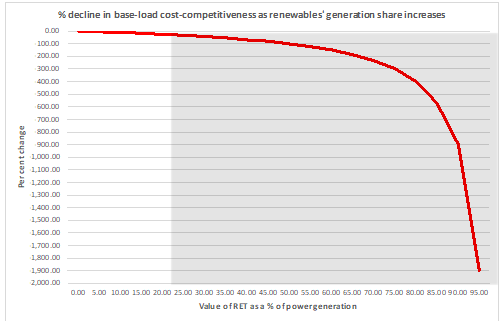 At a 50% RET, base-load power costs increase (competitiveness falls) by 100%. At a 75% RET, base-load costs increase (competitiveness falls) by 300%. At a 95% RET, base-load costs increase (competitiveness falls) by 1,900%. Many renewables enthusiasts will only see 'upside' in all of this. As current base-load power is forced to become more and more intermittent, subsidies and protection costs needed to make renewables cost-competitive will decline, more base-load will close, and rising RET targets will become a self-fulfilling prophecy. Greens will applaud. Raising RETs ensures Australian policy on renewables pushes us within our power cost 'event horizons'. Reductions in subsidies needed to ensure renewables are cost-competitive will be outweighed as viable (but increasingly intermittent) base-load power costs themselves increase. All generators still operating, on average, will charge more if they want to stay in business. They'll all be more expensive, base-load and renewables alike. Will they, together, be as reliable?